INDIANAPOLIS (June 17, 2013) — Klipsch, a leading global speaker manufacturer, today announces the launch of the S3m headphone. Specifically engineered for mobile devices, the Klipsch S3m boasts five color options and offers listeners a universal single-button remote for control of playlists and phone calls. Available in a black, white, blue, red or jade finish, the S3m accommodates listeners’ personal style while offering legendary Klipsch sound in a universally compatible product. Equipped with a one-button remote and microphone, smartphone users alike can play, pause and skip music tracks, as well as answer and end calls. Equipped with the patented oval ear tips for which Klipsch is known, the S3m allows for hours of comfortable, long-term wear. Unlike circular-shaped ear tips that put stress on the pressure points inside the ear, Klipsch’s patented oval ear tips naturally fit the contours of the ear canal, providing comfortable long-term wear. These ear tips also offer superior noise isolation (or passive noise-cancellation), blocking out almost all ambient noise and providing excellent bass. The Klipsch S3m employs a customized 5.8mm moving-coil micro speaker with controlled damping in each piece, allowing the product to deliver smooth, full-bodied sound that’s similar to a more expensive balanced armature design. 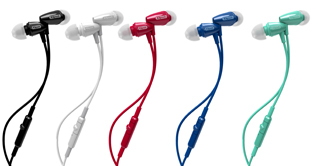 The S3m’s audio works with virtually any device that has a standard 3.5mm headphone jack. Included with purchase are three different-sized oval ear tips, a protective carrying case, clothing clip and two-year warranty. The Klipsch S3m retails for $$49.99 (U.S. MSRP) and is now available at authorized retailers and http://www.klipsch.com.